It's no longer a tinhat theory to assume that your government is watching your every move, although Mexican artist Diego Trujillo might be taking the paranoia to a whole new level in his latest work, "This Tape Will Self Destruct". 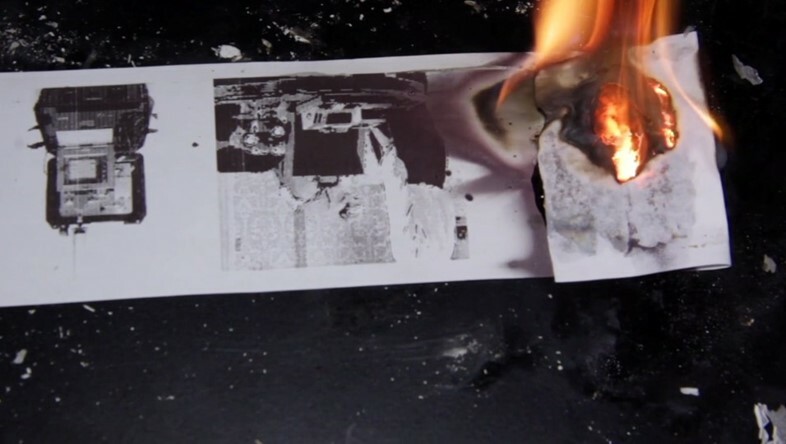 Inspired by Cold War documents and contemporary surveillance culture, Trujillo has created a machine that prints Soviet spy fiction and imagery with the leaked NSA files – and then blows them up in front of you in an exothermic reaction. We spoke to Trujillo about secrecy in the Information Age. How difficult is it to build a self-destructing printer? Diego Trujillo: Very difficult, it took a lot of work, research and testing to get it to a working state, even after a year of working on it there are still things I'd like to improve about it. But I gues that's the nature of most electronic artworks, you can keep working on them forever. Do you think we’re not concerned enough about the fact that everything we say online is being recorded forever? Diego Trujillo: The project isn't so much about things being stored forever, it isn't an alternative to Snapchat. The thing I don't think we're thinking enough about is government secrecy in democracies that claim to be transparent, that's what the project aims to get at, the contemporary notions of unanswerable government secrecy and it's uncanny resemblance to how agents in Cold War fictions were depicted. I feel that as tax payers participating in democratic activities we should demand more of an explanation when things are kept secret from us. Do you worry about the future of information? Diego Trujillo: I do worry about information being captured without consent. It's perfectly fine for Facebook to store my data if I agree to use their service, this is a voluntary action where I agree to give my information in exchange for that service. What worries me is the lack of agency when information about people is gathered without their consent, especially when decisions get made based on that information. Have there been any images or pieces of text that have come out of the printer that you’ve wished you could keep? Diego Trujillo: Not really, everything that I print on that machine has been designed and curated to be destroyed so there isn't anything there I'd like to keep. Does it have a "this message will self destruct" audio messages that plays every time something is printed? If not, it should have. Diego Trujillo: Haha, no it has an LED that blinks rapidly instead, it blinks at a soothing rhythm (about once per second) when it's ready to print and much faster once the print out is about to self-destruct.